This was formerly the $2500 Cash Giveaway Thread where you could post your all time favorite movie and receive an extra entry into the giveaway. It has now been converted to The All Time Favorite Film Thread... so... tell us what it is for you... what is your ALL-TIME FAVORITE FILM? I have many favorite movies but one that stands out for me is the Fugitive with Harrison Ford. Harrison Ford is in my opinion one of the few great actors still around. Movies like the Indiana Jones series, Clear and present danger, and of course Star Wars have proven this. The Fugitive is still to this day enjoyable to watch with plenty of action and suspense with no bad language or other offensive content, just a great all around film. The first time I saw this movie I was on the edge of my seat and couldn't believe some of the stunts that were done, most memorable of course is the jump from the dam into the river below. Who would have thought that anyone wold have done that. The special effects are very well done for the time and still can hold its own in todays special effects world. The train wreck was the only part that could have done some fine tuning as there is some parts that its obvious that a model was used however was done in a way that it was totally believable if it was done in a real situation. On a side note I give an honorable mention to the Blues Brothers movie, still has to be one of the best car chases ever made. One of my favorite movies is Oh Brother Where Are Thou. This movie is loosely based on Homer's epic poem "The Odyssey". It takes place in the deep south during the 1930's. Three escaped convicts search for hidden treasure while a relentless lawman pursues them. The 3 convicts have many journeys with many twist and turns. The music is rich with southern old timey music sung by Alison Krauss, Ralph Stanley, The Whites, John Hartford, The Cox Family and Gillian Welch. Dan Tyminksi is the singing voice for George Clooney on "I Am A Man of Constant Sorrow", the Soggy Bottom Boys song that revives many poor religious people during tough times. I had a chance to see many of these singers in Dallas and their performance was outstanding. A great movie the entire family can watch together. I have never bought the soundtrack to a movie but this one was a must have. that were uniquely 'cinematic' and could not be replicated in any other medium. Hitchcock had many notable montages such as the "Psycho" shower scene and plane attacking Cary Grant in "North by Northwest". travel became lyrical. The climax even allowed viewers to experience the big bang, creation of the earth and other secrets of the universe. is Cinerama" premiere in 1952.
appears. The death of HAL by electronic lobotomy is one of the creepiest in the history of cinema. When I think back on my favorite moviegoing experiences, this movie tops the list. at NYU, the movie was re-issued in 70mm Cinerama twice at The Rivoli on 49th and Broadway which had a deeply curved Dimension 150 screen. Those were the most spectacular showings of the movie I attended. fully lit. Kubrick's effects were not opticals in the conventional sense of the era. them separately and combining them later in an optical printer (i.e. "Star Wars"). all aspects of the production. The fact that Kubrick could make an experimental picture with a big budget and get financing from a major studio proved that you could accomplish anything if you really put your mind to it. The picture was so controversial it became a 'talking point' for critics, buffs and was even discussed in my science class in Middle School. Some reviewers condemned the feature then later revised their opinion after a second viewing. The narrative structure was so unique it threw them off balance. fiction feature (as opposed to space fanstasy) is usually compared to this one. Runner" would not have been possible if Kubrick hadn't lead the way. Last edited by Richard W. Haines; 12-26-08 at 05:05 PM. I too have many favourites. Ones that stick in my mind the most are ones that my brother and I used watch when we were younger and repeat certain parts in the dialog (in character of course). John Carpenter's They Live was one such movie. It's funny, even though it's meant not to be. It's a about a guy who's down on his luck and meets up with another dude in the same boat. Of course they discover a huge extra terrestrial conspiracy. Cheesy acting by "Rowdy" Roddy Piper and backed up by Keith David. Others would include all of the Monty Python movies, anything with Schwarzenegger, and countless Kung Fu movies. Of course I have other favourites when it comes to demoing my home theater. I like X-Men 3, The Hulk, LOTR (even though it's just DVD) and the list grows as new stuff comes out. I bought the Blade Runner bluray set and it's pretty sweet. I had a really difficult time trying to determine which movie I would consider my favorite, but after finding myself repeating the same action a few times a month these past couple months, a winner essentially selected itself. The action I am referring to is finding myself watching Bloodsport on the VS channel no matter how late at night it ends up playing, even though I've already seen it over 50 times, own it on dvd, and can pretty much recite it word for word. I'm just drawn to watching it like a moth to a flame. 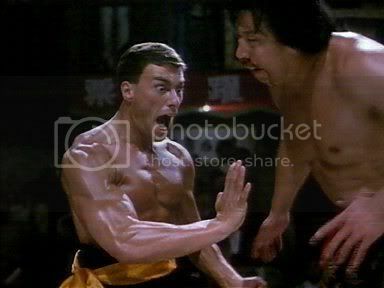 The fim is loosely based upon the real life events of Frank Dux - portrayed by Jean Claude Van Damme. During a flashback it is explained how Frank gets caught trying to steal a sword from Senzo Tanaka's house as a child, and ends up agreeing to be the sparring partner for Senzo's son Shingo in return for not getting in trouble. When Frank defends Shingo from bullies at school, a bond forms between Frank and the Tanakas. Senzo is devastated a few years later when his son dies and he no longer has anyone to pass on the martial arts skills that have been a part of his family for ages. Frank eventually convinces a hesitant Tanaka to train him in place of his son so that he may one day honor the Tanakas by competing at a world martial arts competition known as the Kumite. After some amazing training sequences that show how Frank becomes a highly skilled martial artist, the film leaves the flashback and progresses toward the beginning of the Kumite. Each fighter in this competition is from a different part of the world and fights with their own unique style. The viewer is treated to a large variety of disciplines as the fights play out, each portrayed by a very skilled actor, making the fight sequences entertaining and memorable. Frank - the unknown American at this competition - wins fight after fight and makes his way into the final match vs last year's champion. The final fight is an epic, and when it's all over Frank becomes the new champion, fulfilling his promise of honoring the Tanakas. What makes this movie stand out above all the cheesy 80's attempts at martial arts films? Plenty. The fight choreography, the fleshed out story, the music (top notch! ), and dare I say it.....the production value is actually quite good. There isn't much in this film that will make you roll your eyes like what is so prevelant in a lot of the other martial arts films of the time. No flying kicks with a 20 second hang time, triple backflips, or dialogue that seems like the script was written in one day. It all just comes together very well and the final result is a film a martial arts fan can't help but watch over and over again. If you hate JCVD and you've never seen this film, you may have a change of heart. I still remember watching this movie in the theater when I was in HS. I've probably seen it 50 times. No need to explain anymore. Honorable mentions go to The Last of the Mohicans, Gladiator (Russell Crowe, Jouaquin Phoenix) and American Beauty. All of the movies that do it for me have the following in common. A REALLY good soundtrack, villains that make you hate them they act so well, emotionally gripping scenes/storylines that make you laugh, angry, sad, awed, and so forth. Hmm... for a rockin' Home Theater system has gotta be T2. Blue Velvet, Taxi Driver, Midnight Cowboy, Godfather II, Apocalypse Now. My Dad read The Lion, the Witch and the Wardrobe to me and my brothers when I was about eight or nine. I loved every minute of it and read the whole series several times. So when I heard that they were making a movie out of it, I was very excited. Then I was a little concerned that they might screw it up. But they hit it out of the park! It resonated with me like almost no other movie I'd ever seen. I got choked up the first time when the title came up over the train, and it just kept on from there. The movie seemed to match my highest expectations at every point. It was just as I'd imagined it. Or it seemed so. I hadn't read the book in years. Obviously, not everyone has the same deep seated connection to these stories from their early childhood that I do. But from an "insider's" perspective, this movie couldn't have been more right.